Welcome and thank you for your interest in the New Canaan Country School Parents’ Association, where every parent in our community is a member. The purpose of the Parents’ Association is to support the school’s mission, strengthen our community and raise funds to benefit school programs. In partnership with our exceptional faculty and staff members, the PA fosters a sense of community that is integral to helping our children grow and thrive. The PA offers a wide variety of programs and events. Parent participation offers the opportunity to connect within and beyond the school community, provide valuable support to school programs, and models for our children the school’s ideals of life-long learning and contributing to our school. There is truly a role for everyone where each contribution is valued and appreciated. It is also personally rewarding and great fun to participate in this warm and vibrant community! Please contact any member of the Parents’ Association Executive Council should you have any questions or to learn more about volunteering at Country School. We look forward to sharing the school year together with you and your family! On Wednesday, students from the Middle School visited residents at The New Canaan Inn. A warm gathering was held at the home of Elizabeth Sosnow for the Mothers at Work Resource Group last Thursday, February 28. What a terrific day—we were thrilled to be able to acknowledge our amazing faculty and staff with a day that kicked off with posters and lots of 9th grade enthusiasm. 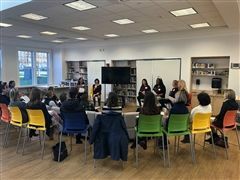 Scott Driscoll, President of Internet Safety Concepts, visited the Country School campus on Feb. 11 and met with a large group of parents and Middle and Upper School students. Mr. Driscoll discussed making smart and safe choices while using the internet, social media, and other technologies. He offered tools, strategies, and safety tips for parents to share with their child(ren). On Wednesday afternoon, 30 students from all divisions gathered for a good cause in the Thacher Motor Room. 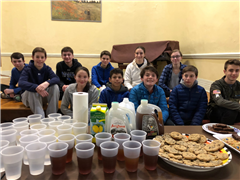 For the second year, Upper School students and parents gathered Saturday evening to provide dinner at Inspirica’s Women’s Shelter in Stamford. Head of School Aaron Cooper kicked off the informal gathering expressing his excitement about the opportunities that exist to bring these communities together. Attendees took a Horizons quiz and Executive Director Nancy von Euler led them through the answers which highlighted not only the K-8 Summer and School Year Programming that takes place right here at NCCS, as well as the multiple ways NCCS families can get involved in Horizons. This year’s Festival of Books was a three-day celebration of literacy at Country School. For the first time, it was held in the recently renovated Schlesinger Library/Amicus Innovations Space. 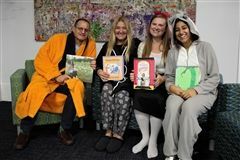 One of the Parents' Association's biggest fundraisers of the year, the Festival of Books also provided many opportunities to build community, as well as classroom libraries. VIEW PHOTOS. 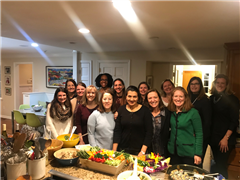 A hearty crew of 25+ moms and students gathered at the home of Jenny Harrington for wonderful conversation, great food and lively fall activities last weekend. Country School continued its annual fall tradition of “Campus Beautification” on Wed., Oct. 17. More than 300 New Canaan Country School parents, faculty and staff gathered for A Country Night Under the Stars biennial dinner and auction, held on campus, April 28. Hay bales, burlap tablecloths and Western-themed decor set a comfortable, casually elegant tone in the party tent, while a mechanical bull ride and live music performed by Doug Allen and his band provided high-energy entertainment. VIEW PHOTOS. VIEW VIDEO. In conjunction with the annual Lower School Earth Day Book Recycling Project earlier this month, the Community Service team collected gently used books from all divisions. 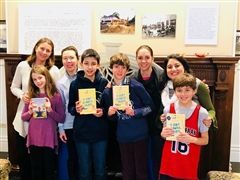 On Sunday, Jan. 28, a group of students and parents met in the lobby of Grace House for a winter-time book read of "It Ain't So Awful Falafel." On Saturday, Jan. 20, a group of Upper School students and parents prepared and served dinner at Inspirica in Stamford. The Country School community, including students, faculty and staff from Early Childhood through Grade 9, recently collected 5,752 pounds (more than double last year’s collection!) of canned and dry food in support of The Food Bank of Lower Fairfield County. 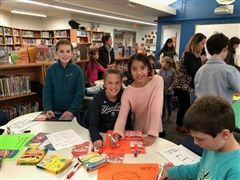 Students and several parent volunteers gathered in the Lower School Library to help get ready for the upcoming all-school food drive. After a quick lunch on Wed. afternoon in Perrine Commons, a group of 15 got to work on designing posters to hang in all divisions and in Grace House over the next two weeks. Country School students from all divisions came together for a Campus Beautification project. 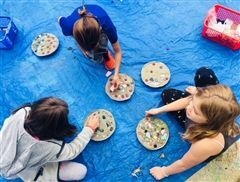 Thirty-five students created artwork and planted flower bulbs for this Parents’ Association Community Service event, an annual tradition in its third year. 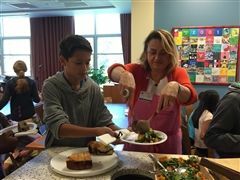 The Global Citizens Resource Group hosted a culinary showcase ‪on Wednesday afternoon in the kitchen of the Stevens Building, featuring renown chef, Silvia Baldini. 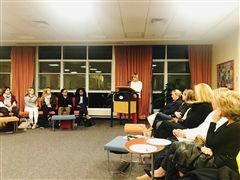 On Tuesday night, Alisyn Camerota, co-anchor of CNN’s New Day, spoke about her new book Amanda Wakes Up, how she balances a demanding morning anchor job and her family, journalistic integrity and fake news. 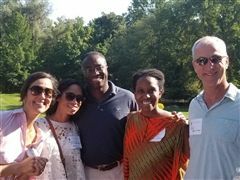 A great time was had by all as new and returning families came together at the Parents of Students of Color Family Potluck to celebrate the beginning of the new school year. The air was filled with the laughter of children as they swam in the pool, swung on the swings and played games in the yard. The parents enjoyed themselves as they watched the children play, reconnected with old friends and established connections with new friends. 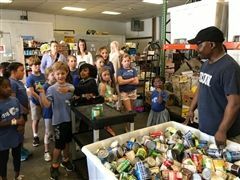 In support of Country School’s ongoing relationship with the Food Bank of Lower Fairfield County, the Lower School held its annual spring food drive from May 8-17. All four grades kicked off the drive with a hands on, age appropriate lesson, which focused on the importance of the Food Bank and how it serves our neighbors in need. In the spirit of Carol McCloud’s classic children’s book, “Have You Filled a Bucket Today? 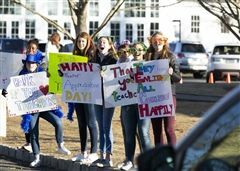 ", 25 Country School students from EC, LS and MS gathered after school onFeb. 8 and filled one large bucket with Valentine’s Day cards for clients of New Canaan’s Meals on Wheels program. 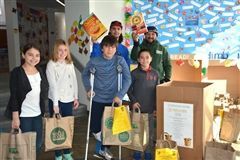 New Canaan Country School students in grades 1 through 9 recently collected 2,240 pounds of canned and dry food in support of The Food Bank of Lower Fairfield County, which provides nutritious food to non-profit organizations serving under-resourced communities. 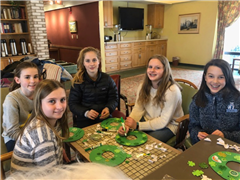 On Wednesday, October 26, 19 New Canaan Country School students and 9 of their parents and/or caretakers visited the New Canaan Inn, a local senior center. The purpose of the New Canaan Country School Parents’ Association (NCCS PA) is to support the school’s mission. 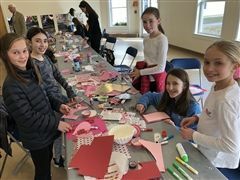 The NCCS PA strives to strengthen the Country School community by promoting communication, parent education programs, community service and connections among parents, faculty and students. 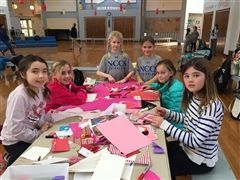 In support of these goals, the Parents’ Association seeks to raise funds for programs that benefit the school community, including the NCCS financial aid fund.